Heavy Duty Rubber Insulated Cable 4 Cores CSA: 1.5 mm² Length: 5 Meters This flexible .. Heavy Duty Rubber Insulated Cable 4 Cores CSA: 1.5 mm² Length: 10 Meters This flexible.. Heavy Duty Rubber Insulated Cable 4 Cores CSA: 1.5 mm² Length: 15 Meters This flexible.. Heavy Duty Rubber Insulated Cable 4 Cores CSA: 1.5 mm² Length: 20 Meters This flexible.. 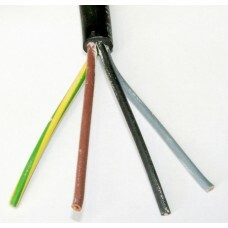 Heavy Duty Rubber Insulated Cable 4 Cores CSA: 1.5 mm² Length: 25 Meters This flexible.. Heavy Duty Rubber Insulated Cable 4 Cores CSA: 1.5 mm² Length: 30 Meters This flexible..